It seemed to Jimmy Butler that life in the NBA was his life all over again, ignored and rejected as a child back in Texas, overlooked by all the big basketball schools when he so much wanted to play, secondary at Marquette as a backup role player when he arrived and then watching, watching, watching all the time even as Bulls teammates went down all around him to the point that with even Derrick Rose and Joakim Noah out in last year’s playoffs Butler still could get in for just three minutes the entire six games. He badgered his buddy Ronnie Brewer, his small forward position guide, Luol Deng, the coach he worked with, Adrian Griffin. He knew the plays, he worked as hard as anyone. The team needed him. He was sure. Keep working, Butler was told. Be patient. Go to summer league. Learn your craft, the league, your job. Your time will come. It seemed to him he was being ignored again. But not anymore, just like always. Jimmy’s time would come. It has, and Butler isn’t overlooked anymore, not the way he stayed with LeBron James for all 48 minutes Monday and led both teams in rebounding with 14 and added 21 points and two of four three pointers in the Bulls 93-86 Game 1 playoff win over the defending champion Miami Heat. “It’s crazy. This is what I wanted,” Butler was saying Tuesday as he patiently endured questions about being the LeBron stopper, which he certainly assured everyone he was not while celebrating the win over any statistic. “When I wasn’t playing I always wanted to play. Now I’m playing 48 minutes, so I shouldn’t complain. Like golfer Bubba Watson said when winning the Master’s last year it was so terrific he didn’t even dream that big. Butler wants to get it right, from his small Texas hometown of which he carries reminders in the cowboy boots he wears and country music he listens to, both somewhat unconventional around NBA locker rooms. To the way he plays as Butler now has played the full 48 minutes in three consecutive playoff games, the first since Allen Iverson a decade ago. 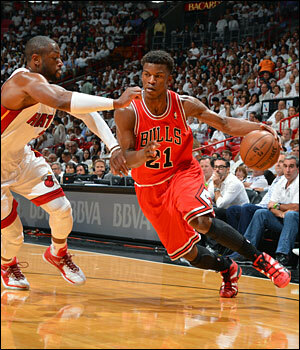 It likely will continue as the teams play Game 2 in Miami Wednesday with Deng likely out with his serious virus. Kirk Hinrich probably is out as well, further depleting the Bulls perimeter defense, particularly against the perimeter oriented Heat. Though lost in Butler’s play especially defending James with Deng out has been the extended minutes as well for Marco Belinelli, who played almost 47 in Game 1 in combining with Nate Robinson for the big winning shots late. Belinelli is averaging more than 41 minutes in the last three games. Butler also knows what’s coming, like one of those tornadoes rolling across the Texas plains. But Jimmy Butler knows tough. Not that defending LeBron James and playing 48 minutes a third consecutive game isn’t. But it’s not like life. The basketball is the fun part. Butler’s story is well known, similar to the “Blind Side” Michael Lewis book and movie about football player Michael Oher, a black athlete out on the street befriended by a white family and then onto athletic success. Butler doesn’t talk about it much because like his basketball, his nature is to defer attention. He always credits teammates for any individual success and quickly switches the conversation when praise is aimed at him. He always says things are great with him. Butler has become accepting of interviews, though you can see they remain a chore beyond defending James. He slouched and squirmed in an easy chair for about 20 minutes Tuesday as the team held its mandated media session at their hotel. Robinson was patient with the questions, if not exactly revealing. You can see Butler brighten only when teammates are mentioned. He laughed about Robinson’s fractured lip was recalled and how the players needled Robinson and fondly remembered Brewer when the old Bench Mob was mentioned. He has a light way about him, teammates say, though he remains measured in public. Butler was out on the street as a young teen in Tomball near Houston. He eventually was befriended by a high school freshman who helped pursuade his family of seven to add Jimmy. Not exactly with a stable life previously, Butler had been somewhat overlooked. He didn’t shoot well, anyway. He didn’t get scholarship offers, though he loved the game and dreamed, like most kids. So he went to junior college. He thrived there and got Division 1 notice and chose Marquette even though he wasn’t sure where it was. So he brought his cowboy boots. It’s another reason Butler is so popular among teammates. No Texas accent, but as they like to say a heart as big. Butler became Williams’ first recruit, though Butler wasn’t his first priority. They’d gone there to recruit a Butler teammate, Joe Fulce, who later would stop playing after a serious knee injury. But like in many places, Jimmy grew on them. It’s tough enough being 1,000 miles from home and in Milwaukee. But also not starting. Butler came off the bench as a sophomore, not always that thrilled about it. But Marquette was developing a strong program of versatile players, like Wesley Matthews and Lazar Haywood, who played ahead of him then, and later playing with Jerel McNeal, Darius Johnson-Odom and Jae Crowder. Butler started as a junior and senior, again mostly as who he has become, the guy you don’t notice who is out there all the time. Butler led Marquette in minutes played his junior and senior seasons, though he would be 30th in the first round to the Bulls in the 2011 draft. He played 359 minutes last season, sitting out 40 games by coach’s decision for an average of a bit more than eight minutes when he did play. He averaged 2.6 points and shot 18 percent on threes. So it was off to summer school, which Butler embraced, playing for the Bulls summer league team in Las Vegas last July and being one of the league’s best players. Of course, it was mostly against guys trying out to play overseas, but it was basketball. There’s been much discussion of how Bulls coach Tom Thibodeau has done so well with so many injuries and illnesses and issues with the Bulls. Which is true. And he’s been the coach of the playoffs. But team building is not only having a strong coach who is demanding, but players of high character who are competitive and no matter the demands placed on them will seek to succeed. Guys like Butler, who being a pro wasn’t important. It was being good at his job. Still, there were no promises. The Bench Mob was gone, and Butler had his job, to try to provide some of what both Brewer and Kyle Korver did. He always says how grateful he is to those players for helping him. But this was his chance, like junior year at Marquette. Fans were upset. They missed their Bench Mob and wanted them back. Butler played sporadically to start, 5.7 points in 16 minutes in November, 5.0 points in 20 minutes in December. Butler said he didn’t recall when there was an “it” moment in the season. But he said there was one. I know when it was. It was the first time the 6-7, 220-pounder played 48 minutes in the NBA, which was his first NBA start. It was back in January in a loss to Memphis as Deng went out with a hamstring injury. Butler went all 48 without seeming to sweat, which is the rarity about those long games for him. He had 18 points and nine rebounds. Hmmm. Deng stayed out a few games. Then it was 43 minutes and 10 points and eight rebounds in a win against the Lakers; 46 minutes with 18 points and nine rebounds in a win over Detroit; 44 minutes with 16 points and 12 rebounds in a win over Golden State; 45 minutes with nine points and six rebounds in a loss to Washington. Deng came back, but Thibodeau now was convinced. Butler could play, and he could play the minutes. He was a go to guy. Butler went back to the bench, but eventually Richard Hamilton fell out of the starting lineup and Butler became a starter the last 14 games of the season and into the playoffs. Though he only averaged 8.6 points and four rebounds this season, he averaged 14.5 points and 7.1 rebounds as a starter. He’s an early favorite for next season’s Most Improved award when he should move into the Bulls starting lineup as the shooting guard with Derrick Rose’s return to full health. As new waves of reporters came through everyone asked about being tired. Butler seemed more tired about answering the question. They all seemed to want to hear he was going to sleep. But Butler said he wanted to be outside in the sun with teammates. No wild partying, but enjoying life. No time to be tired. “Enjoying the Miami weather,” he said. “I enjoy every moment. That’s what you want. You want play against and be on a team with those guys, the guys you see on TV you always wanted to go against, the best. As a competitor that’s what you want to do. I was tired, but I was excited. A big win in Miami is hard to do.